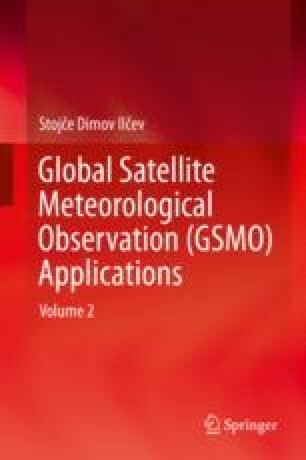 This chapter introduces global meteorological satellite networks for weather observation and imaging. As stated in Volume 1 of this book, satellites are objects that orbit larger object, such as planets or moons. The Earth’s Moon is an example of a natural satellite, and Earth itself is natural satellite of Sun. Thus, communication, navigation, weather, and other artificial satellites are the result of human ingenuity. There are two main types of weather satellites, defined by their orbital characteristics: Polar Earth Orbit (PEO) and Geostationary Earth Orbit (GEO). Most satellite weather images seen on the local television news or the weather TV channels are produced by GEO satellites. The GEO satellites orbit the Earth above the equator at the same speed as the Earth rotates around its axis, so they are able to transmit a continuous meteorological picture of the region below their footprint. However, the PEO meteorological satellites are orbiting in the significantly lower and shorter, taking about 100 min to travel from pole to pole and produce high-resolution snapshots of the Earth.